Paul donders around Glenallachie Distillery, Speyside. 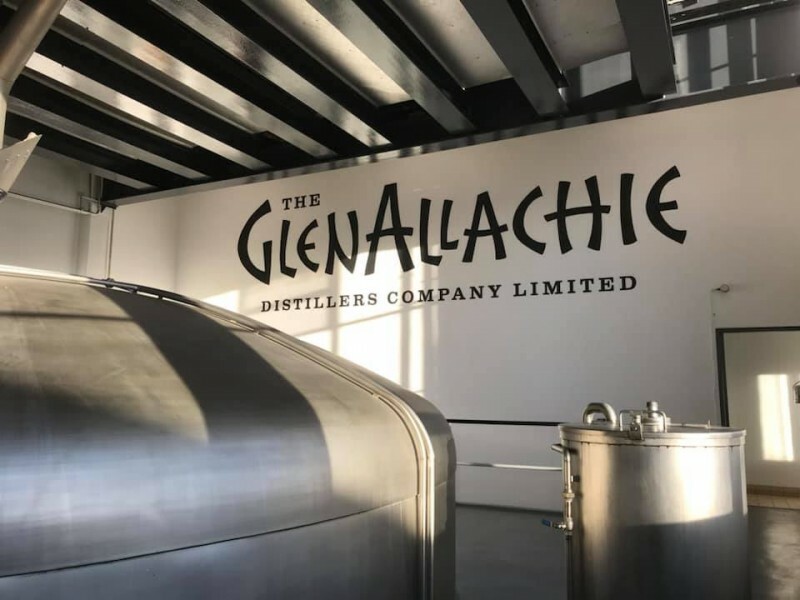 In October 2017, Billy Walker, Trisha Savage and Graham Stevenson purchased the GlenAllachie Distillery. With over 100 years’ experience between them, many would have expected our three veterans to retire. No chance. GlenAllachie spirit was predominantly used in blended whiskies pre their purchase. Now the GlenAllachie is an exceptional single malt. The name GlenAllachie comes from the Gaelic (as many Scots distillery names do), Gleann Aileachaidh meaning ‘Valley of the Rocks’. The geology surrounding the distillery is littered with Celtic runes and Pictish stones. The historic bits; Glenallachie was founded by Mackinlay, McPherson and Co to provide malt whisky for the Mackinlay blends, the distillery boasts fourteen warehouses. The building was planned as early as 1940, by architect William Delmé-Evans, designer of Isle of Jura, Glenallachie was not founded until 1967. Invergordon Distillers acquired Charles Mackinlay Ltd from Scottish and Newcastle Breweries Ltd., the deal included the Isle of Jura and Glenallachie Distilleries. Campbell Distillers, a subsidiary of Pernod Ricard, acquired the distillery in 1989 and was later transferred to Chivas Brothers supplying a number of blends including Passport and 100 Pipers. Chivas Brothers agreed to sell Glenallachie to The GlenAllachie Distillers Company (Billy Walker, Trisha Savage and Graham Stevenson). In an email sent in June this year, Billy Walker announced that he had ‘finally disengaged’ from BenRiach, the company he built up and sold to Brown-Forman for £285m… the message ended with the line: ‘Here’s to the next journey,’ – the purchase of the Glenallachie Distillery a month later came as no surprise to those in the know.The deal included the Glenallachie single malt brand, and blended whisky brands MacNair’s and White Heather. 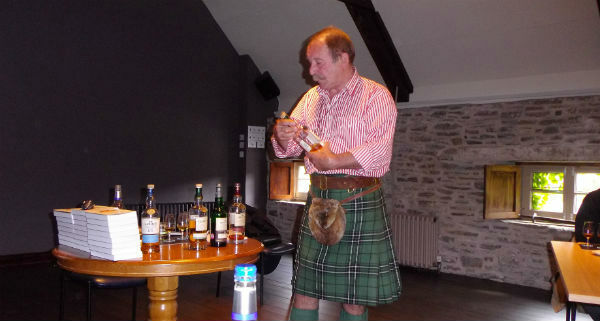 In November 2019 Paul, along with pal Ando took the opportunity to tour the distillery, approx. 1 year after the three Amigos purchased it. Mr Walker said of the new GlenAllachie core range: “The first release has been a culmination of months of hard work and a passion to turn GlenAllachie into a very popular and much sought after single malt whisky. The range of casks we have warehoused is tremendous with nearly 50,000 maturing at our distillery, some of which date back to the 1970s. Our aim is to nurture this tremendous spirit and for these single malts to be admired both home and abroad.” Ando got down to the serious business of tasting (Paul was driving). We arrived a touch earlier than 9.30, we were eager! Exterior photos done, we then had a great personal tour, the tasting/blending room, the distillery itself with wash backs, stills etc, nicely laid out. After this we moved on to the warehouse, drams from casks, wow! I now have a distillery enters my top ten – aye I will be back with Australian guests in February. The GlenAllachie Distillery release of a series of Single Cask Editions, the first batches of single casks. Master Distiller Billy Walker has personally chosen a selection of casks that showcase the GlenAllachie spirit in a variety of different ages, flavour profiles and cask types. Eight of the specially selected Single Casks will be available exclusively in the UK, with the remainder being released across key export markets including Europe, Asia and the USA. THE EIGHT UK CASKS Ranging in age from 10 to 29 years old, eight Single Casks have been specially selected for the UK by Walker, who bought the distillery near Aberlour in Speyside with his business partners Graham Stevenson and Trisha Savage, in October 2017. Each of the single casks are bottled at natural strength, with no added colouring and unchilfiltered to enhance the flavour.